The holidays are an exciting time, especially in college. You get a break from college courses and a break from all those piles of homework. Your classes start winding down and you get to see your friends more. Most importantly, you get to visit home and do some dorm room decorating for the holidays! It can be tough deciding how you want to decorate your dorm room for the holidays. There are so many dorm essentials to decide on, and it's even tougher when you think about the fact that you're in a college dorm room. As much as you want to, you can't invest in a large dorm Christmas tree like your parents have at home. However, just because you can't have an overly large dorm Christmas tree, that doesn't mean that you can't have one at all in your college supplies! It simply means you're going to be adding a compact dorm Christmas tree! 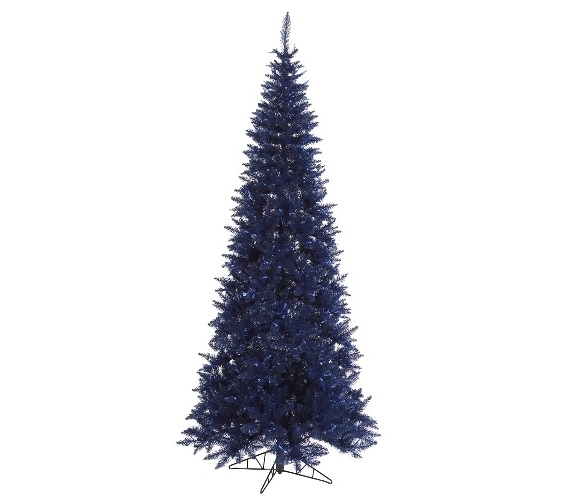 Our 4.5'x24" Navy Blue Slim Fir Tree has a slim style that makes it perfect for college dorm rooms. Taller than it is wider, you don't have to worry about losing a lot of dorm room storage with this dorm necessities item set up in the corner of your college dorm room. This dorm item also has a classic Christmas color with a little bit of a twist. Dorm Christmas trees are typically green. However, this dorm item is a deep navy blue color that is still a Christmas color yet will make your college dorm room decor really stand out!